TORONTO, ON – August 16, 2018 – There are many reasons to be excited about the arrival of the 2019 Lexus ES series – as brave new styling and dynamic new handling and performance join the ES’s unparalleled comfort, refinement and luxury. Now, there’s another reason for excitement, as the all-new, seventh-generation ES will also be competitively priced. Nobody can craft a luxury hybrid like Lexus – which benefits from most popular and proven line of self-charging hybrid systems on the planet. And the ultra-efficient 2019 Lexus ES 300h sets a new standard for luxury that’s also remarkably efficient: Rated at just 5.3 L / 100 KM (city/highway combined), it’s one of Canada’s most fuel-efficient self-charging hybrid luxury vehicle on the road today. 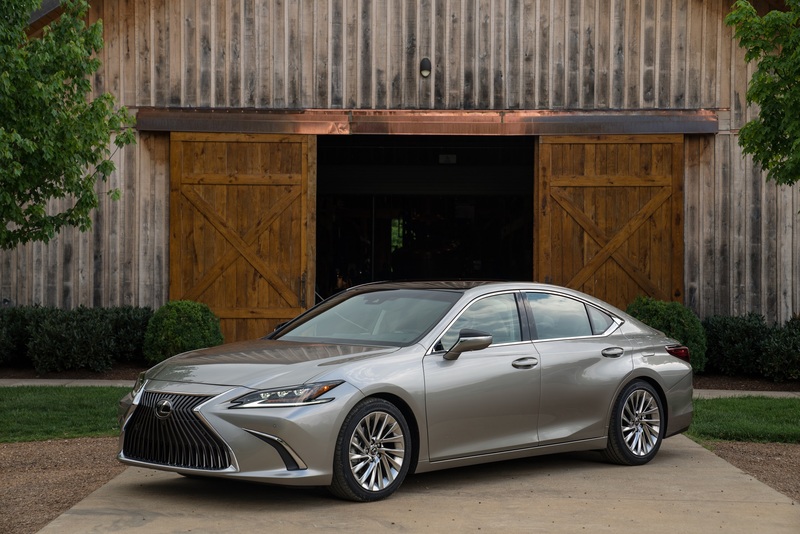 And with a starting MSRP of just $47,000, the 2019 ES 300h delivers more power, better handling, improved efficiency, and more luxury amenities for less than the 2018 model it replaces. It’s also just $2,000 more than the starting MSRP on the new ES 350, making a self-charging hybrid a highly competitive choice. The 2019 ES 350 starts $2000 below the ES 300h at an MRSP of just $45,000while delivering more impressive performance than ever. Built around an upgraded V6, an all-new eight-speed Direct Shift automatic transmission, improved suspension, plus the option of the first-ever ES F SPORT this luxury sedan is engineered for drivers. Regardless of model, all 2019 ES series models are built on the Lexus Global Architecture – K (GA-K) platform. This platform enabled engineers to significantly boost handling even as they further refined the ES sedan’s already impressive quiet, comfortable ride. Meantime, designers took advantage of GA-K to style a body and cabin that capture the Lexus passion for exciting, emotionally engaging automobiles. All new ES models also feature an impressive list of new technologies as standard. The ES is the first Lexus offer Apple CarPlay, which joins Entune 3.0 to provide a comprehensive connectivity package. The ES also introduces Lexus Safety System + 2.0 – a major upgrade to the bundle of sophisticated safety technologies designed to enhance driver capabilities to improve safety. The new ES series delivers everything that traditional Lexus owners value, along with new features that will draw in drivers who have not previously considered a Lexus. With competitive suggested pricing, the ES luxury sedan is ready to engage with a broader range of customers. The 2019 Lexus ES 300h with Premium Package (starting MSRP: $50,800) adds a Lexus Navigation System, heated steering wheel, 12.3” Display Audio system, the Blind Spot Monitor and Rear Cross Traffic Alert safety systems, and more. The 2019 Lexus ES 300h with Luxury Package (starting MSRP: $57,600) builds on this, adding Triple LED headlamps and the Adaptive Front Lighting system, unique 18” alloy wheels, full leather seating, the QI wireless charging system for smart phones, and more. The 2019 Lexus ES 300h with Ultra Luxury Package (starting MSRP: $61,500) further enhances the Luxury Package, adding unique 18” alloy wheels with noise-reduction tires, a 17-speaker Mark Levinson Premium Audio system, touch-free power back door, 10” head-up display, semi-aniline seating, the Bird’s Eye View Monitor safety system, and more. The 2019 Lexus ES 350 with Premium Package (starting MSRP: $48,800) adds a Lexus Navigation System, heated steering wheel, 12.3” Display Audio system, the Blind Spot Monitor and Rear Cross Traffic Alert safety systems, and more. The 2019 Lexus ES 350 with Luxury Package (starting MSRP: $55,600) builds on this, adding Triple LED headlamps and the Adaptive Front Lighting system, unique 18” alloy wheels, full leather seating, the QI wireless charging system for smart phones, and more. The 2019 Lexus ES 350 with Ultra Luxury Package (starting MSRP: $59,500) further enhances the Luxury Package, adding unique 18” alloy wheels with noise-reduction tires, a 17-speaker Mark Levinson Premium Audio system, touch-free power back door, 10” head-up display, semi-aniline seating, the Bird’s Eye View Monitor safety system, and more. The 2019 Lexus ES 350 F SPORT 1 (starting MSRP: $50,400) features a Drive Mode Select system with S+ mode, adaptive variable suspension systems, the Blind Spot Monitor and Rear Cross Traffic Alert safety systems, rain sensing wipers, a lip spoiler, active noise control, and more. This model is finished with unique F SPORT detailing, including 3-spoke steering wheel, 19” alloy wheels, and Nuluxe seating material. The 2019 Lexus ES 350 F SPORT 2 (starting MSRP: $54,800) adds Lexus Navigation, a 12.3” Display Audio system, a 10” head-up display, triple LED headlamps with the adaptive front lighting system, and more.